One of my favorite things to do during the summer is to invite friends and family over and entertain outdoors. I usually do that when I’m at my parents’ home in California because, as we’ve been moving frequently over the past several years with my husband’s company, we haven’t taken the time to invest in our own outdoor furniture. We have all these plans for creating an outdoor oasis for our new home that we’re currently building on “Tall Trees Lane”, our nickname for our build. 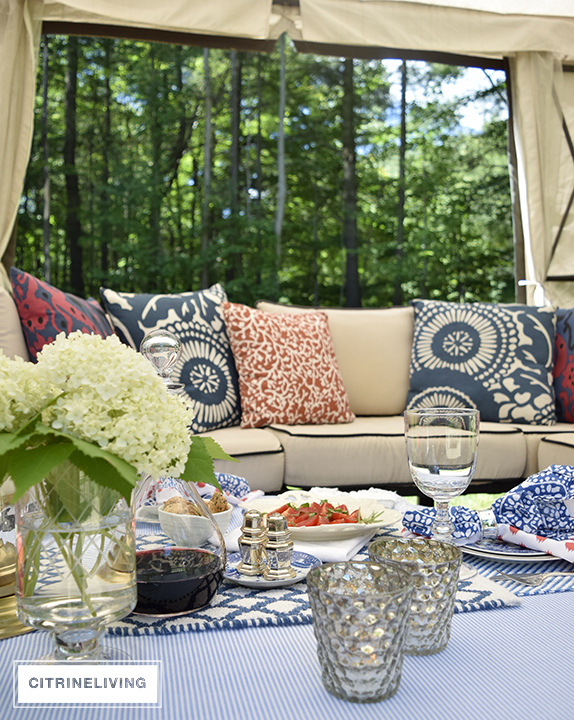 As I look through several friends’ blogs, I thought you’d want to see the inspiration I’m pinning as well so I’m sharing tips for entertaining outdoors this summer in today’s blog post. Turn your porch into a cozy oasis! Welcome to my friend Kelley Nan’s porch makeover. Her pops of blue are so soothing and summery. She created the sweetest relaxing date here for her darling husband. Hop on over to her post and see the view of this porch at night when all the twinkling lights are on. You can read all about how Kelley transformed this space and see what she served for their special night at home. How adorable is she?! So many of us have porches that we are not utilizing but Kelley will inspire you to work on yours so that it’s a fun space to lounge and entertain at this Summer and not just wasted space or a place to store things. Kelley did such a lovely job! Create an outdoor drink station for your guests! Next, we visit my friend Rebekah from A Blissful Nest. Rebekah is so fun to be around so I just know she is a really fun hostess. Anytime you are entertaining outdoors, your guests will want to know where to find a cold beverage. While many of us have brought out a cooler with ice and drinks for our guests, this outdoor drink station that Rebekah made is so much cuter! Your guests will just love it! Provide fun for everyone outdoors! There’s nothing like a great backyard makeover and my friend Marta McCue recently finished hers down in Florida. 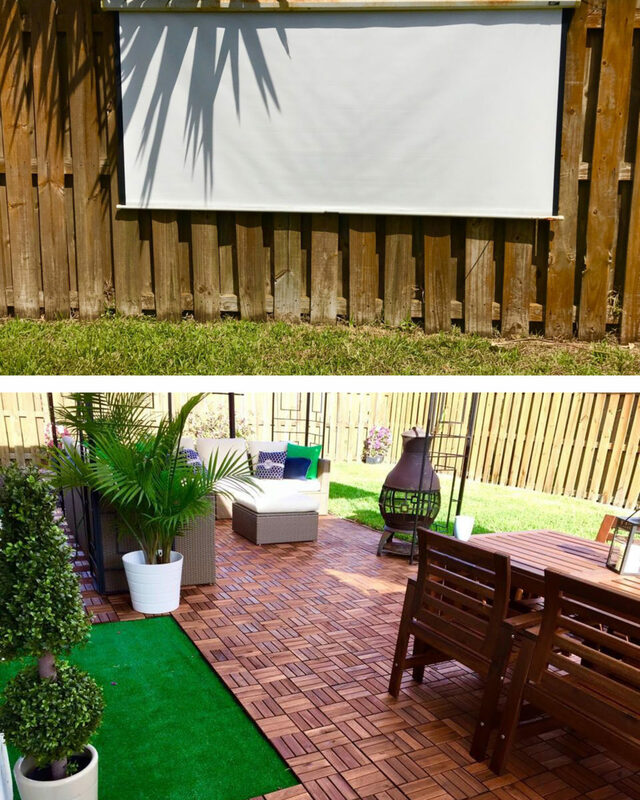 Not only did Marta include a table for eating and a sitting area to lounge in, she also created fun for her friends and family by adding an outdoor movie screen. It’s so easy to do and after the sun goes down, you can project movies from DVD’s, cable, etc. Read more here to see how Martha did that. It’s funny how kids would rather grab all their friends and watch a movie outdoors in the summer. Often, we think of throwing BBQ’s and outdoor parties for friends and family or even saving it for a special occasion. However, my dear friend Tamara from Citrine Living knows that the most important kind of outdoor meals are the ones for just you and your other half. Sometimes you just don’t feel like getting dressed up and going out to an expensive restaurant or fighting city traffic. Why not create a special and romantic space in your very own backyard? With your favorite beverage and appetizers to your most-loved dishes and desserts, a night at home in the backyard might just be the best time ever spent together! Isn’t this set-up that Tamara created just dreamy?! Anyone can do it. Read more about it in her blog post and grab some inspiration to surprise your significant other this Summer! I just love this. Host an unforgettable pool party! There’s nothing better than inviting your friends over for a pool party in the summer. Whether it’s for a birthday or graduation or just because it’s Summertime…a pool party is always a good idea! I used to throw one at the end of the school year to celebrate. 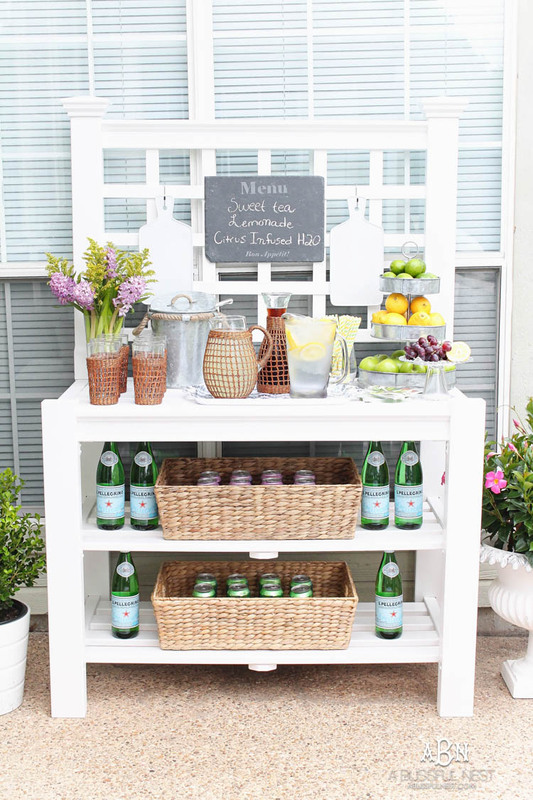 Rebekah from A Blissful Nest shared her outdoor drink station above, and now check out this party! I can hardly believe it! Wait until you see all the details! Her decor, her printables, her food and drink served….it’s the perfect pool party bash that I know you’ll want to recreate. Read here for every detail and more pictures. It’s so hot while I’m writing this blog post that I want nothing more than to jump into that blue pool! 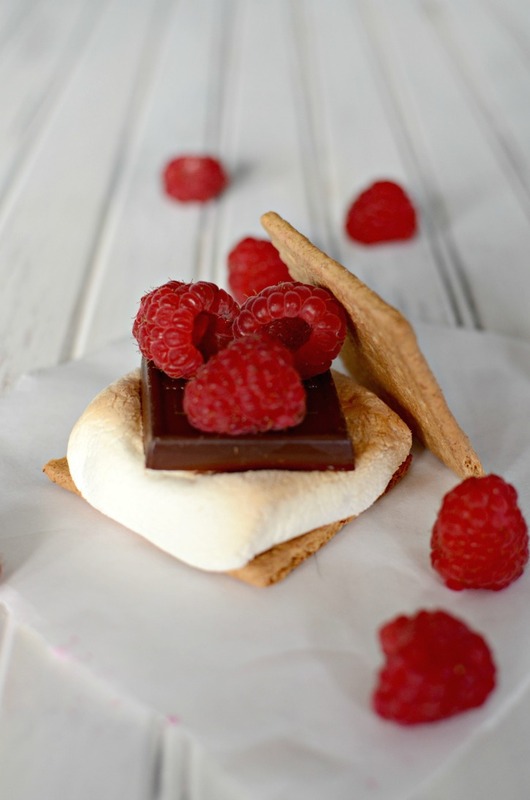 My mouth is already watering just looking at this Raspberry Gourmet S’More Recipe that Kendra from Simply Darrling shared. Making s’mores are a must-do every summer but we’ve enjoyed trying new s’more recipes each year. I love chocolate and fruit together. But adding the marshmallow and graham cracker makes it a little bit of Heaven in your mouth! Yummy! How cute would these be to make?! 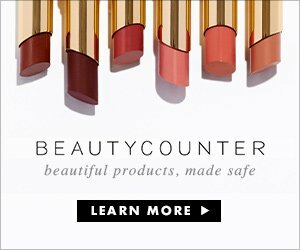 I bet your guests will love them! And how about this drink to wash them down….. I had to share Rebekah’s summer drink recipe that is totally delicious! 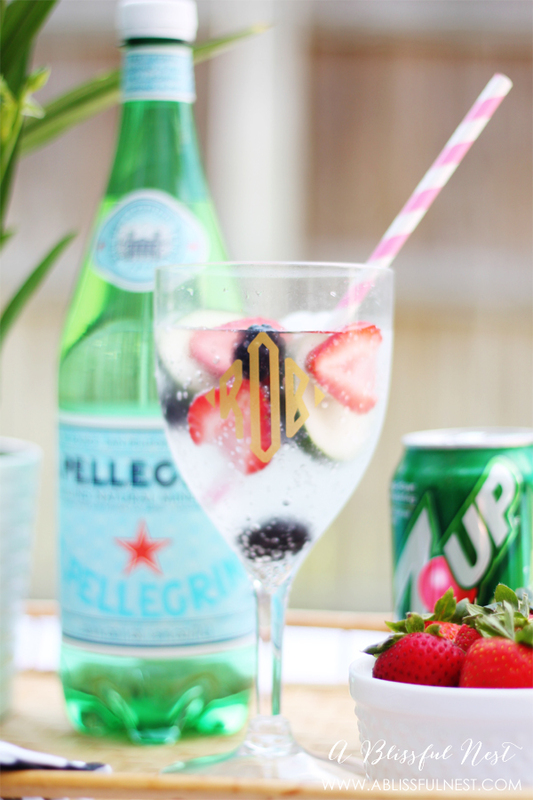 This Cucumber Berry Spritzer is so absolutely refreshing and since it’s non-alcoholic, it is perfect for all ages! I sure do love berries in anything during the spring and summer! Al Fresco dining on the porch! I love eating outdoors! I’ve shared in many posts that I love to set a nice table for my family each week and that includes when we are eating out on the patio as well. My friend Rhoda from Southern Hospitality shows how to do this perfectly. Ditch the paper plates and cups and bring out some of your fun colored dishes and serve ware! I like what Rhoda said, “Having a porch with a table is one of those small pleasures in life for me…”. Isn’t that how we should treat those spaces?! 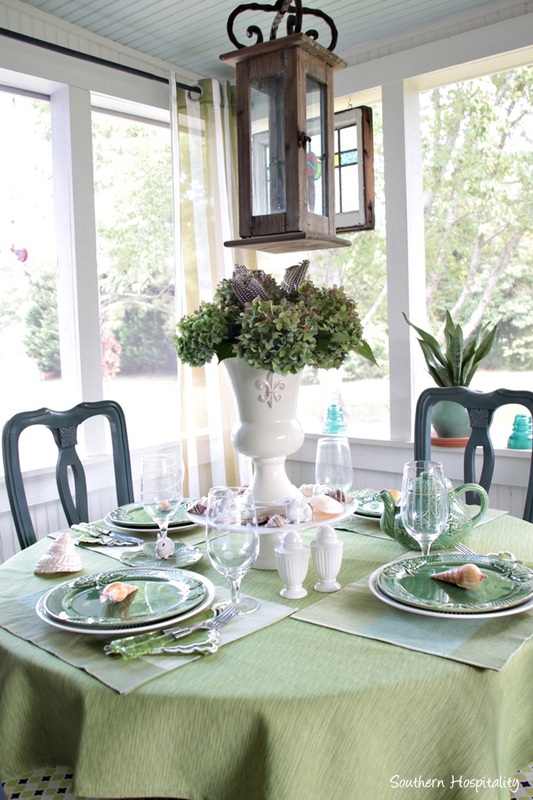 Create a change of scenery and do something nice for your friends and family by setting a beautiful table like Rhoda’s and serve them your favorite summer salads and dishes! Read more about Rhoda’s gorgeous outdoor table here and make plans to do the same! 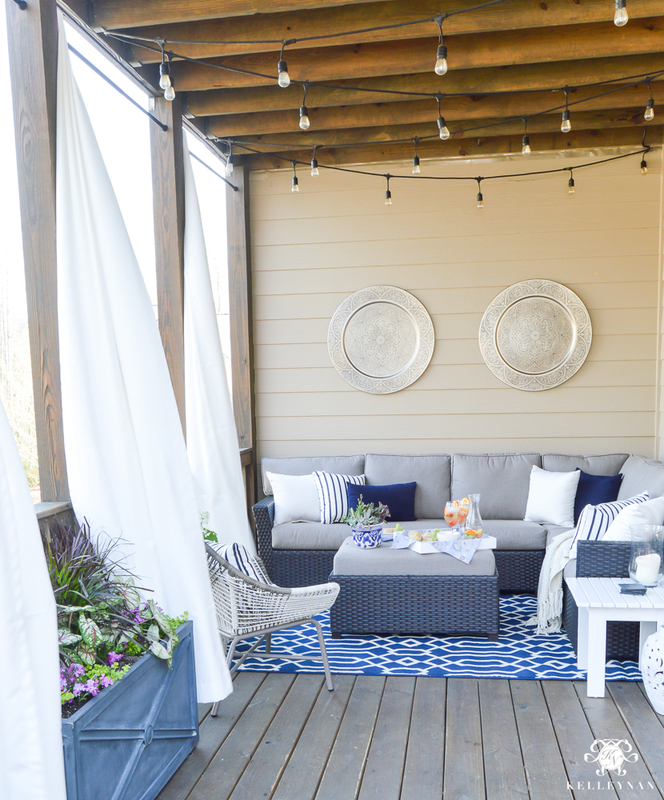 Try something new by making your outdoor entertaining unforgettable with all of these fun tips that I’ve shared from my friends today. Make sure to pin all of these fabulous ideas to Pinterest and follow along with their blogs as well! You’ll find inspiration for days! Thanks to each one of my friends for allowing me to share today! I would love it if you subscribed at the top of the page in order to receive my weekly emails of all my latest blog posts and hear about your next month’s calendar & freebies, as well as sales or new items in My Online Shoppe. You can also follow me on Instagram, Pinterest, and Facebook to see what I’m up to in creating a home and lifestyle of inspiration! These are amazing and I am so honored to be included. I HAVE to try that raspberry smore! Um wow! Xoxo sweet friend- are you 100% yet?